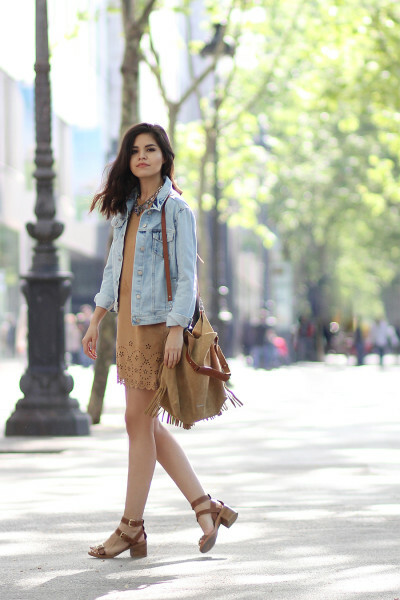 How to Style Suede Outfit In This Fall – Suede is a statement. But without the fuss. The thing about suede is that it’s so much more than just a fabric, don’t you think? This plain ol’ borderline cowboy texture has the incredible ability to take us places and decades we’ll never go to, while having the major fashion ability to be all at once. It blends with any outfit, making it look retro sophisticated, it stands on its own in head-to-toe understated glamour. madewell suede wayfind jacket worn with the oversized shirt + flea market flares. Related post Picked Color: How To Wear Maroon Outfit For This Year! A high, fitted waist tops this ’70s inspired A-line skirt composed of soft microfiber suede.